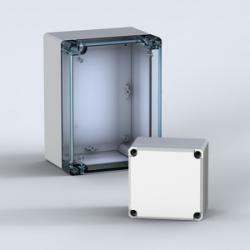 The ABS terminal box range, DABP, with a IP 66, 67 protection degree, is available off the shelf in many different sizes. The DABP range is well suited for demanding environments, since water and dust are prevented from entering the terminal box, thus eliminating the risk for component failure, and with that unnecessary downtime. Body, cover, cover screws manufactured from stainless steel, mounting screws and cover plugs made from polyamide.